1968, Burbank, California. Six years after his last number one single, Elvis Presley records an intimate television concert surrounded on all sides by screaming fans. 2016, Shoreditch Town Hall, London. Greg Wohead re-enacts the television broadcast, now known as the 1968 Comeback Special. Well, sort of re-enacts it. In The Ted Bundy Project, Wohead dissected our morbid fascination with violent figures and his own disturbing attraction to serial killer Ted Bundy’s confession tapes.Comeback Specialonce again unravels the fabric of fascination, though this time it’s the famous rather than the infamous under the microscope. What makes an icon, a King? And what might happen if we try, briefly, to bring him back? Wohead arranges the audience on four sides of a raised square stage in Shoreditch Town Hall, mirroring the layout of the Burbank studio. Chairs and a microphone stand are placed just so. It’s a perfect reconstruction in some ways, deliberately imperfect in others. Drained of the bright, synthetic colour of 1960s fashion, Wohead’s version is a shadow or skeleton of the original event. Recreated in monochrome, this is a black-and-white negative of the 1968 Comeback Special. An echo. A ghost. The whole event is, supposedly, about authenticity. “I want you to see who I really am,” says Wohead/Elvis in a seductive drawl. That was the whole point of the television broadcast: to offer fans a glimpse of Elvis the man as well as Elvis the star. The King and his musicians jam together, while Elvis talks to the audience between songs. Yet at the same time, as Wohead tells us, this was all carefully constructed: the television show was pre-recorded and released in multiple different versions. How is it even possible to recreate something that exists under myriad guises? Wohead builds his re-enactment slowly, in careful layers. At first, the dynamism of the gig is rendered oddly static. Everything is told, not shown: Elvis’s appearance, the layout of the television studio, the position of the cameras, the clothes worn by the fans. Wohead talks us through every last detail of the recording, the meticulous description juxtaposed with a complete refusal to imitate. “You can see that my hair is black, obviously,” says Wohead, looking at us through his mousy mop. Even the lyrics are spoken, deadpan, rather than sung. And then gradually, bit by bit, Wohead takes on aspects of Elvis’s physicality. A curling lip. A thrusting hip. Then, later, that distinctive voice. That unmistakeable “uh-huh”. 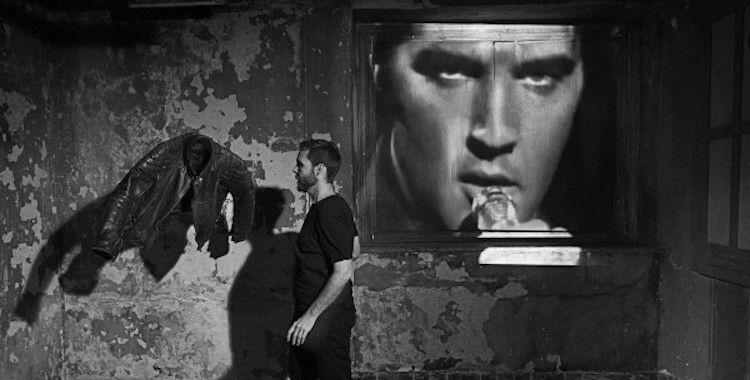 Wohead’s is a fragmented impersonation, isolating individual elements of Elvis’s performance. He works like a forensic scientist, as if in search of some elusive essence. Is it in the voice? The recognisable quiff of hair? Those hips? But meaning resides as much with the audience – the audience then, in the television studio, and the audience now, in Shoreditch Town Hall – as it does with either Elvis or Wohead. Attention is drawn to the ways in which individual spectators cherish moments of eye contact or precious souvenirs: a sweat-soaked handkerchief or a piece of lint plucked from Elvis’s cheek. A good chunk of the show is dedicated to recreating one small moment of interaction between Elvis, the audience and one of his band members, Wohead building the encounter piece by tiny piece with the help of the audience. The choice of re-enactment also feels crucial. The 1968 Comeback Special is the scene of Elvis’s career resuscitation. But it is also, perhaps, the moment everyone realised for the first time that he was human and fragile and as vulnerable to time and age as the rest of us mere mortals. This is not Elvis as he was in the years before his death – fat, drug-addled, washed-up – but he is no longer quite the untouchable young man he once was. He is, as Wohead puts it, “caught between”. Scrolling through YouTube the day after watching the show, there’s something hypnotic about the videos of the 1968 Comeback Special. It’s the way the whole event flirts with failure: Elvis interrupts his own songs, jokes about forgetting the lyrics, laughs in a way that is at once exposed and in control. This is not Elvis at the height of his powers. And the footage of the television show itself, when it finally appears in Wohead’s performance, seems flimsy and thin, projected onto translucent cloths hanging behind the four sides of the stage. The King is little more than a flickering image, fleeting and insubstantial.